Dash Media Entertainment party SINCITY: the ever anxious party is here! SINCITY: the ever anxious party is here! Yo! This is it! It's finally official, the ever anxious event so far is finally here. 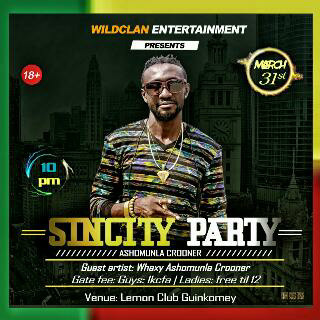 Wildclan Entertainment presents SINCITY PARTY. The Guest Artist for the night is none other than WHAXZY Shakamura (Ashomunla Crooner) and the guest appearance is yet to be disclosed. Gate fee: guys: 1kCFA and ladies: A gulp of drink to be taken at the entrance. Please note: this party is not for kids and its strictly for 21 plus and above. PS: ESEP university presents Mr /Mrs ESEP plus Award night on MARCH31 At Segbeya carifo Samsung store, immediately after SINCITY party. 0 Comment to "SINCITY: the ever anxious party is here!"